A few weeks ago, I asked you how I should make over an off-white wingback chair I got from my local thrift store. 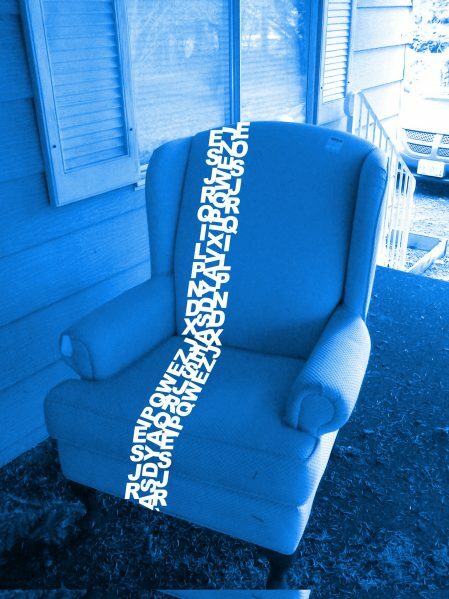 You told me to remake the chair with a typography stripe. 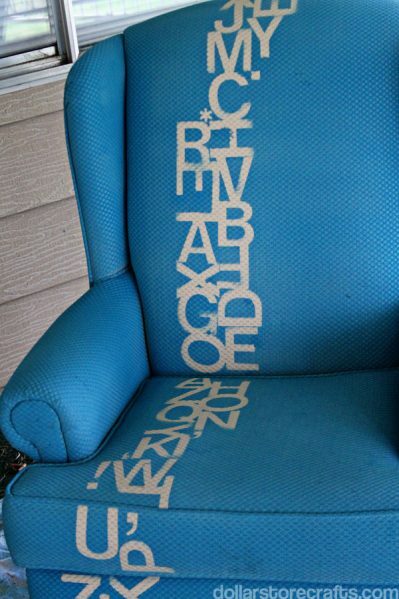 I used Simply Spray Upholstery Spray and some Helvetica vinyl letters I had on hand to give my boring old chair a fun makeover. Read on for my instructions on how to paint a chair, and a giveaway [update: this giveaway is now over] for 6 cans of Simply Spray Upholstery Spray. So I started by sticking the vinyl letter stickers to the chair. Once I started playing with the stickers, I decided to do a more free-flowing line that meandered across the chair instead of being completely straight. I really like how that part turned out. I knew that using the stickers with the spray would be a gamble because they don’t stick that well to the fabric. After I painted the chair, Simply Spray told me that they have a trick for thin stencils. “We usually use adhesive spray on the backs on stencils and even stickers to make sure they stay straight and to keep the paint from soaking through. Sometimes the force of the air coming out of the can actually moves the stencils too so it’s a huge help.” So, if you want to go the stencil route, you will have best results if you use spray adhesive along with the stickers or stencils. The Simply Spray Upholstery Paint instructions indicated that you MIGHT get up to 17 square feet of coverage. I had two cans of upholstery spray paint, and I was really hoping I had enough to complete the job. Once you paint , you need to go in after spraying and sop up the paint that is beading up on the stickers so it doesn’t drip. Also, don’t forget to mask off parts of the chair that you don’t want painted (like the feet!). Apparently, this is my first rodeo because I got so excited about painting the chair that I forgot to cover the feet. It’s okay, though! I was able to (mostly) wipe the paint off the legs while it was still wet. After I finished the first bottle of paint, I let it dry for about an hour before I went in with my second can of paint for another coat of color. While it was wet, the coverage looked pretty good, but I wished I had a third can of paint. Once it dried, the spots that needed more paint become more obvious (near seams). I would recommend rubbing the paint into the fabric, but in this case, I couldn’t rub the paint because of the letter stickers. I sopped up the 2nd coat of paint from the stickers, and then immediately removed the stickers so they wouldn’t drip. You can tell that the paint leaked under the stickers in a few spots. I wasn’t sure if this effect would work or look bad once the chair was dry. Turns out, the overspray on the letters looked a little too rough once the chair was dry, so I decided to outline the letters with a paint marker to define a line along the edges of the letters. I then filled in the areas that bled with the paint marker. The paint marker worked fairly well on the chair, but it still looks hand-drawn, which isn’t exactly what I envisioned when I started the project. But like I said, I knew I was taking a risk by painting over the stickers. And two cans of spray paint are definitely not enough. I didn’t know this until after I finished the project, but Simply Spray recommends six cans of spray for a chair or recliner. So, I only used 1/3 the amount that they recommend. So, the verdict on Simply Spray Upholstery Paint? Overall, the process was quick and easy. It didn’t turn out as vivid as I wanted, but I did not use the correct amount of paint. If you are looking for a quick and easy makeover, Simply Spray is a good option. The paint works best on lighter fabrics i.e. turning a beige pillow brown. It’s not really possible to turn a black lampshade plum. Upholstery Paint is perfect for sofas, chairs, curtains, carpets, lampshades, and even place mats. 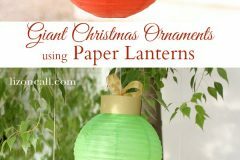 It is also a great way to bring life back to a stained or older item. Where to get Simply Spray? 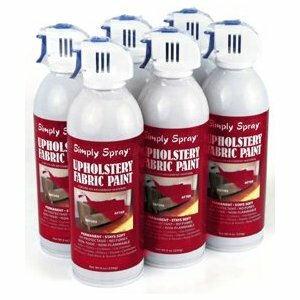 JoAnns Fabric and Craft Stores and Hobby Lobby carry the Simply Spray Upholstery Paint, and online at SprayPaint4Fabric.com. And daily inspiration on the Simply Spray Facebook page. 1) Comment here to tell us what you would paint with Simply Spray Upholstery Spray. Quick Rules: Residents of USA, 18 and older. Ends on Thursday 3/8/2012 at 11:59 PM. Winner will be announced here in this post on 3/9/2012. Disclosure: This post was sponsored by Simply Spray. I was compensated for my time, and provided with free product. Affiliate links. All opinions are my own. I have a porch loves eat I’d love to try this on! Well, I’m from Bulgaria so no way I’ll be able to win this. Still, the chair looks incredible! If I had this kind of materials I would’ve tried to maybe write something on the chairs, just for fun. Lovely! I would paint a bench that I have in front of my large living room window. Thanks. [email protected]. I might try this on a love seat as well. I would use it on and old chair I have oggling! I would paint the cushions in my (90’s)travel trailer to give them a more updated look. My loveseat needs a makeover! It was my aunts, the fabric pattern is subtle-former-telephone-operator-reserved-lady pale floral, not a match for my not so subtle living room. I cant afford to re-upholster it, covers never fit right so when I saw your facebook project post – BINGO! If I were to win I would love to repaint the cushion on a of a peir one chair I got for free. I would use this product to make a seat for the storage bench we made last summer, it’s just waiting for a cushion! Have 2 cream sofas that desperately need to be updated with a darker color (red, perhaps), after living for several years with a small child and 2 small dogs! I would paint an ugly orange chair that does not go with anything in our house! I think I would spray all of the cushions to our sectional a deep maroon color. :) Recovering them sounds like entirely too much work, but they really need some sprucing up! I have a small love seat that opens up to a foam sleeper. It is so useful when the kids have a friend sleep over. BUT it has gotten beyond soiled from the kids that I have just been using a slip cover. But the slip cover doesn’t fit well and is always shifting since this is a smaller sofa. So this spray paint would be a perfect fix! Thank you for the offer. I would paint a chair that I have temporarily* hidden under a large blanket. *Temporarily for the last five years. I always find beautiful vintage chairs that are a great shape, but the color is really dated or doesn’t go with my place. I would love to finally but one of those to paint! I have an ottoman that has seen better days but is still structurally sound. I would love to brighten it up a bit! I have a chair that I would love to use this on. The chair has a couple of spots where my cat has been sneaky and sharpened his claws, so I’d like to add some creative patches to cover those areas and paint the rest of the chair with Simply Spray! I think the plum would be a great color to contrast my sage green sofa! I would paint a tired old couch that is sitting in my living room! This stuff looks great…much easier than making a slipcover or reupholstering! My husband has a papasan chair with an off white cushion that I’ve been trying to clean for a month now. Once I get one side scrubbed & back to white, dirty spots seep through to the other side. I can’t get it dry fast enough to not soak through. I think simply spray fabric paint would work miracles to bring this back to life! My Mom has a chair that would be perfect for this. I have a sofa and love seat that are a green paisley that I would love to turn solid brown. Wonder if it would work. They are too curvy for a slipcover. I would paint my chair that my grandfather used to sit in everyday. I wish I had known about upholstery paint sooner. I have passed up many lovely chairs at yard sales and thrift stores because of stains and not wanting to pay to have them reupholstered. If I win I see a trip to the local Habitat Re-Store in my future to pick out a cute armchair to paint. I have my grandfather’s old recliner that I’ve been dying to redo! This is a great product! I would use it to redo a chair I have. I’d paint the chair my MIL recently passed on to me. I love it but it’s in dire need of a redo. Your chair looks fantastic and the color you chose is beautiful! I desperately need help with a white hand-me-down sofa. White things are not meant to be in my home. I’m a total klutz. Did you clean the upholstery prior to spraying? I would paint my couch. And yes, we would need to buy more paint (probably). When my oldest son was a baby, we would let him lie on the couch and eat his bottle. He would drip. So now there are some watermarks, one of which is shaped rather like a part of the male anatomy. Awkward. It’s still a good couch, but the watermarks and fading mean it’s not as pretty as it used to be, and I’m not a fan of slipcovers. I might redo the rocker that I got when my daughter was born. Or my black couches that have been hiding under slipcovers for five years (although that might require a few more cans of paint). 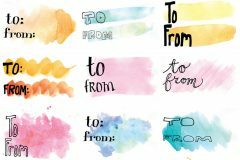 I had the thought while reading this post that if you (or another reader) were to try something like this again you might be better off cutting the letters out of freezer paper and ironing them to the chair. Simply Spray sent me some products to try and I didn’t have good luck with any of them. It’s a good concept, but you do have to use a LOT to get it to cover well. I’d love to paint my stained dining chair seats with this! I can’t wait to try this on my love seat! This is awesome!! I have the comfiest, coziest pair of chairs that I sit in to read or craft, but boy are the uuugggllyyy!!!! I would love to put a cool design and spray them. I’m not clever enough to figure out how to reupholster! 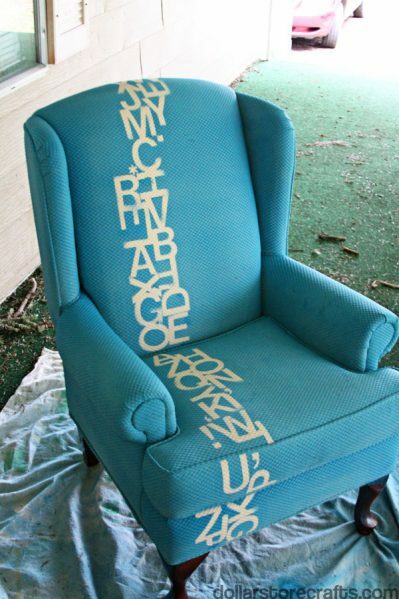 I would spray paint my very, very ugly couch! I would make t-shirts with my girls for everyone in their high school band. My daughter has a chair in her bedroom…it has seen many accidents and I would love to repaint it! I would paint my daughters bench, the colors are horrible but it was a gift from grandparents so we use it anyway! I would recover my favorite recliner. It is so comfy, but an ugly washed out shade of pink. I’ve been considering reupholstering it, but this would be so much easier. My Husband’s old chair he got from his Grandfather that I’ve been threatening to throw out because it’s pretty scary looking. This would save his comfy chair. I will paint the seats of a couple of bar stools that I got today at the Goodwill. The stools are great for me but the color of the material does not work. I had never heard of fabric spray paint before reading your blog today. I do appreciate your trying products and then writing up the results. I especially appreciate that you declared what went right and what didn’t work out so well (like needing more that expected of the paint and the blurb about wrapping the wood before starting to spray. You made me laugh cause that is sooooo what I would do.) Such a good idea fabric spray paint. Thanks for the post. It really was relevant in my DIY today. My couch needs freshing up from fading and kiddo spills. If that works out, there is this stained white chair at the Habitat Shop that is calling my name to be rehabed. I have been wanting a “big” comfy chair for doing my crocheting and watching TV. If I won would be a good reason to thrift/garage sale shop to find the perfect one needing a lil’ TLC. Hi FIVE! Now that is a chair. Very cool. I have a pale beige chair that is asking for this. I also see on the website they offer a glow-in-dark version. Yup – It’s gonna happen. Well done! Have fun w your new chair! I’d use one can on stenciling a few t shirts for my boys, then I have some cloth covered barstools, while functional, do not match my kitchen at all. We’ve got a chair that desperately needs a makeover. I keep thinking I will make a slipcover for it, but painting it sounds like an excellent idea. I would paint a loveseat that lives in my teenaged daughters’ room. What a fun idea!! I have a hand-me-down chair that has great bones but badly needs a makeover! Not sure what color yet, but this sounds like a great way to go! I keep finding chairs with great shape/comfort to use as reading chairs in the kid’s rooms but they are a hideous color. THis gives me hope. I would paint my hand-me-down burnt orange recliner or the matching armchair, or both if I had enough paint! I think I’d use this to give my tired old couch an interesting look, or I’d visit the thrift shop for something fun – I just realized I don’t have much upholstered furniture – probably because of the furkids and foster furkids – pleather and hard surfaces are much easier to get cat & dog hair off of! But that’s also why I won’t replace my living room couch, so a makeover would be fun! 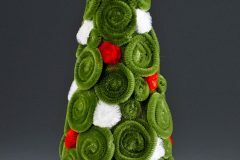 Would love to paint my “green” rocker that matches NO rooms in my new home! Thanks for the giveaway! This looks neat. I’d spray my rather old living room chair and give it a new life in the guest room. 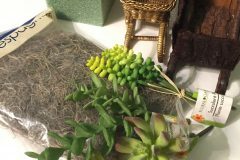 Thanks for the giveaway, and the great website overall – I get tons of ideas from you. The chair looks awesome! I am planning on moving soon (once I get a job… sold all my furniture a few months ago and moved across the country) and will be buying new or new-to-me furniture, and I am certain that I could find some gems that just need a new coat of love! 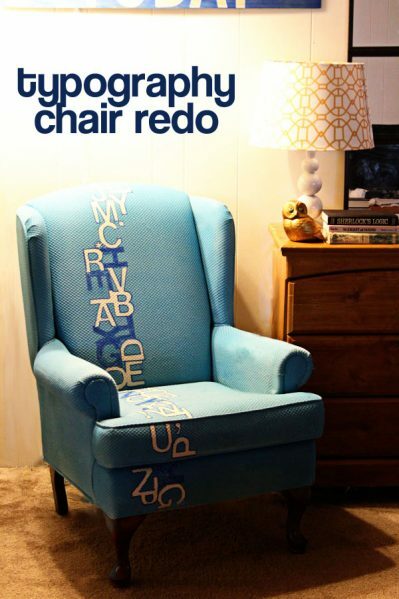 I would use the paint to redo a office chair that I use in my craft room. I would use this paint on a similar project. I’m currently searching for just the right chair for my sewing table and desk. This would take color out of the equation. I would paint a large momogram on a large entry rug…what a great way to greet company!! I would use the paint to add a pattern to the play white chairs around my dining room table. 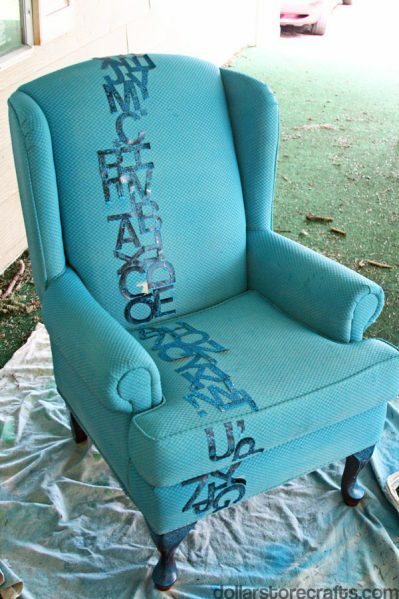 I’d love to try this on some faded patio chair cushions, if the paint is suitable for outdoors. If not, it would be great on a much loved upholstered rocking chair so it would better coordinate with my new(er) couch. They carry this at Michael’s Craft Supply stores in Canada. I believe this product is also best if you have furniture that is faded and simply needs a color boost instead of a whole make over. I’ve got a love seat that desperately need to be updated! 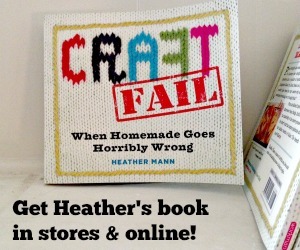 I’m not into sewing so this is a WONDERFUL option!!! I have a chair I’m picking up on Sunday that I will be painting..I really could use this paint!! i would paint an upholstered headboard! I got a rocking chair when I was pregnant with my first child, and now both of my children sit on it with their snacks… The cushions could use a makeover. I have a 1970’s gold velour chair that desperately needs a makeover and I’ve procrastinated due to the cost of upholstery. This would be a perfect solution for me! Since my oldest daughter moved out, I have been making-over her room into a craft room. 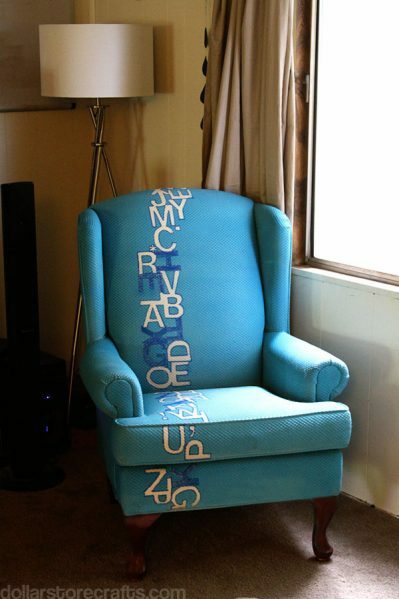 I would use Simply Spray to paint/coordinate a reading and a desk chair. Love the project! I would paint my boyfriends futon cushion. I have almost the same wingback chair, which I got for free from a neighbor. This looks like a great idea! I really need a redo of our plaid couch in the den. It’s a hand-me-down from my MIL. It’s very comfy but does not match at all. Thanks so much for the giveaway! Your chair looks so great! I love the letters! If I won I would paint the love seat we got for free. As a graduating college student I can’t complain about free furniture but gosh, it’s an awful color! This fabric paint is new to me, but sounds wonderful… the possibilities are endless… I’m thinking of creating a custom rug for the kitchen, creating my own fabric patterns for throw pillows and other crafts. The chair is a work of art, and has inprired me to do something like it for an ottoman. Wow! I have a couch that I would love to spray and 6 cans would be a good start to that project! I’m at teacher at Lake Travis High School where we are putting on a production of The Lion, The Witch, and The Wardrobe. We’ve done everything else in Narnia bright, funky, non-realistic colors, but I still have a boring white arm chair that I couldn’t figure out how to fix up. I would love to try using the Simply Spray Upholstery Spray on it. I have an amazingly comfortable rocking recliner that is orange and brown and green striped (eek! )…it looks SO out of place in our grey and yellow living room! I’d love to paint it all black or dark brown! 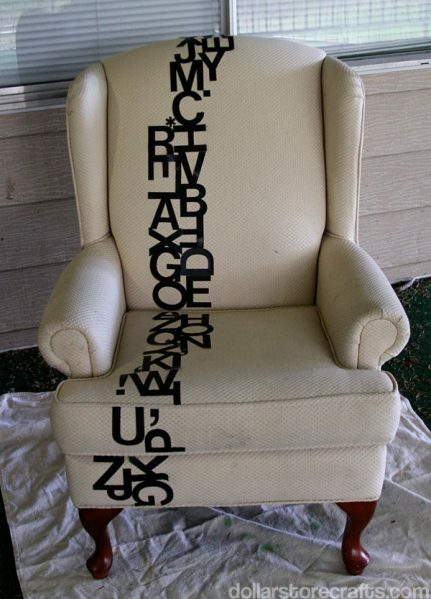 I have two chairs in my basement that are perfect for the alphabet stencil makeover! The chairs will be perfect for my classroom/reading center! If I win I will be doing this craft project of spring break! I love how your chair turned out. I was reading on the website for simply spray and found you can use it on car seats. I would use it to refresh our car upholstery the Arizona sun has faded them quite a bit. Love redoing things I already have. Upholstery paint!!! Who would have thought. A great idea!! My mom has these queen Anne chairs with faded blue upholstery. She wants to reuphoster them, but it would be pretty expensive because its pretty detailed. But we could just PAINT them instead! This is great! I would spray paint my favorite matching vintage(1950s) chairs that I can’t afford to have reupholstered. I love those chairs but the fabric is wearing a bit thin and they just don’t look good. We have two chairs that have become sun faded. We would love to paint them Black or Grey to coordinate with our new grey sofa and love seat. Or paint them to put them in the kids room. I have an old couch that was given to me after an unfortunate fire at my place. Its in good condition except for the cushions on the bottom part, I think saddle brown upholestry paint may be a more flexible and cheaper alternative to getting them slipcovered or re-upholstered. Thank you. Hi! I am totally impressed with the paint and your project. Very nice! Truthfully, our couch is really looking dingy, it is very well built and sturdy but it is ugly! The flowers are fading and well it truly needs a makeover. Thanks for the opportunity! Do they have a primer colour from dark fabrics to something lighter, or just dye-paint for application to lighter pieces? My kiddo reading area has a big comfy chair that is in desperate need of some TLC and a make over! This is an amazing solution. I have this ugly sectional that, bless it, has seen better days. and I would love to paint it something vibrant and fun so I can stop throwing sheets over it to hide all the stains. would love to make some stenciled totes. Love this!! I can’t tell you how excited I am to try it out! I would paint a chair that I pulled off the side of the road! I couldn’t believe someone would get rid of it, even if the fabric is faded! It’s an absolutely darling shape, and will be so cute with an accent color! My daughter will be going off to college in the fall. There is an 1980’s recliner that could use a dorm-room friendly update to go with her. Oooh, I have an UGLY wingback recliner that a friend gave to me but I have been too intimadated to reupholster it. I would think twice about painting it though. I have an old chair very similar to the one in the post that I would love to spray paint!! I’ve been wanting to add a chair to our foyer. This would make the job so much easier! Love this stuff! but I didnt buy enough cans for refreshing my grandmother’s chair so that projects been on hold for over 6 months now. I would love to win this giveaway, great idea and product! I would paint a chair I have. I’m from Australia so I can’t enter. BUT, I think the chair looks great and I just wondered what you thought about how the paint covered the stains? Would the third, fourth, fifth or six can make a difference do you think? We have a very comfortable, but quite hideous couch that someone gave us – I would love to repaint it. Thanks for the giveaway! i have a wonderful thrift store chair that i am dying to repurpose, this would be perfect! FABULOUS!!! I have a wing-back chair I got for free from my sister that is currently green with little polka-dots all over it. Not exactly my design choice so to be able to repaint it would be awesome!!! My father passed away 4 years ago unexpectedly and I was given his beloved chair. I love this old thing but it doesn’t match my decor. I would love to paint it use it in my room. I want to paint my reproduction Victorian loveseat and if I like it I’ll paint my parlor chairs. New upholstery is too expensive when you don’t have a job yet. I think I’ll get that green paint that I bought simply because it “looked pretty”. I would use it to paint the roman shades in my son’s room to match it now that he is getting his forest room, I can’t find shades in the exact color I want so this would be great. Love your chair! It turned out really darling. I have an off-white, well, it used to be off-white, couch. Now, it’s sort of dingy and dirty. I would LOVE to change the color of this couch. This would be fabulous to have. oh my goodness I can’t wait to see if I can find this paint locally! If not I guess I can order from Amazon. I am not sure if you can paint seat cushions for outdoor furniture, but this would be my number one makeover project! If not suitable for outdoors, this is surely going to work on the comfy sofa in the new family room that still has lots of life left in it, but it totally the wrong color! great product! I would love to use this paint on my husbands recliner. It doesn’t match our house and my hubby is clinging onto it. He uses the excuse that “he brought it into the relationship.” So I have accepted that it is here to stay. If it was a fresh color and all the same color at that, I would like it a lot better. I have a chair similar to the sample but it is faded and needs a lift! I have a bench that could badly use a new cushion colour. on my old chair.. so comfy but dated. I would paint our thrift-shop rocking chair. It works great but the upholstery is very faded in spots, so it could really use a pick-me-up! I recently bought what was supposed to be, a Tullsta chair, from Craigslist. My hubby and I got it home, only to realize it’s a stained Solsta.